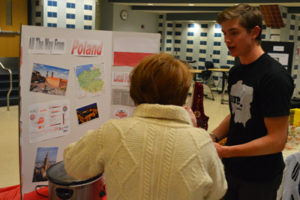 Columbia High School was transformed into a world’s fair on Thursday evening as students displayed poster boards, performed demonstrations and distributed food to celebrate diversity at its first ever Multicultural Fair. 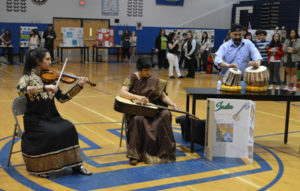 Guests viewed student artwork and watched demonstrations such as Irish dance, Indian music and Korean martial arts. Montiel, Hutton and Roizman attended planning meetings, organized about 80 student stations in the cafeteria and gymnasium and coordinated the keynote speaker’s appearance. 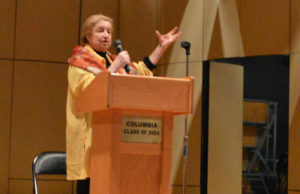 The evening was highlighted by keynote speaker Kati Preston, a Holocaust survivor who recently published her memoirs titled “Holocaust to Healing: Closing the Circle.” She spoke to a crowded auditorium about her childhood in Hungary, growing up in a wealthy family and how her life dramatically changed because of the Holocaust. “The Holocaust didn’t happen overnight,” said Preston, who had a Jewish father and Catholic mother. Little by little, the Jews in her town had their rights steadily stripped of them, she said. They were forced to register with the police, then they couldn’t attend college or high school, they had to wear a gold star on their clothes so they could be identified, and eventually, they were sent to live in ghettos. Preston’s father was taken away and sent to Auschwitz, where he later died. Her mother sent Preston to live with a young Christian woman in the countryside to protect her. The woman hid her in the attic of a small barn to keep her safe. Preston (pictured right) recalled a time when three soldiers arrived at the house looking for Jews. Before leaving, they decided to look in the barn. Preston hid silently under the hay as they pierced their bayonets through the hay all around her. Eventually they left without finding her. When the war broke out, Preston returned home to live with her mother. They lived on very little food under a constant barrage of bombings. After enduring the horror of the Holocaust, Preston said she was so filled with hate that there was no room for anything else in her heart. She decided to let go of that and chose to find the good in people. She had four children of her own and worked in many different career fields, including journalism and business. She is currently writing another book and tells her inspiring story at public appearances. She concluded her speech by expressing her faith in young people, like the students involved in Columbia’s Multicultural Fair. “I have tremendous hopes for the younger generations,” she said.